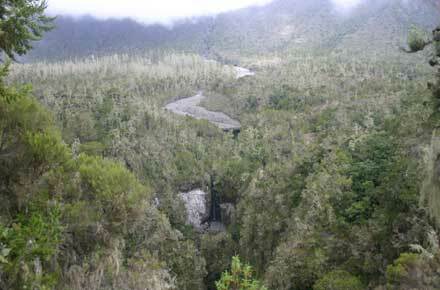 Climb this extraordinary horseshoe of cliffs around a chasm created by a cataclysmic explosion of this once vast volcano. Two days of ascent through outstandingly beautiful and interesting forest, then heathery shrub, then alpine plants, onto raw rock and ash. 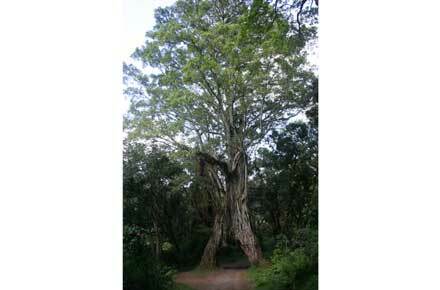 You should meet a lot of interesting animals: buffalo, giraffe, bushbuck, colobus monkeys, maybe an elephant or two. Struggle to the 4,566m peak for a pre-dawn view across a sea of clouds to the vast bulk of Kilimanjaro silhouetted against the eastern sky. 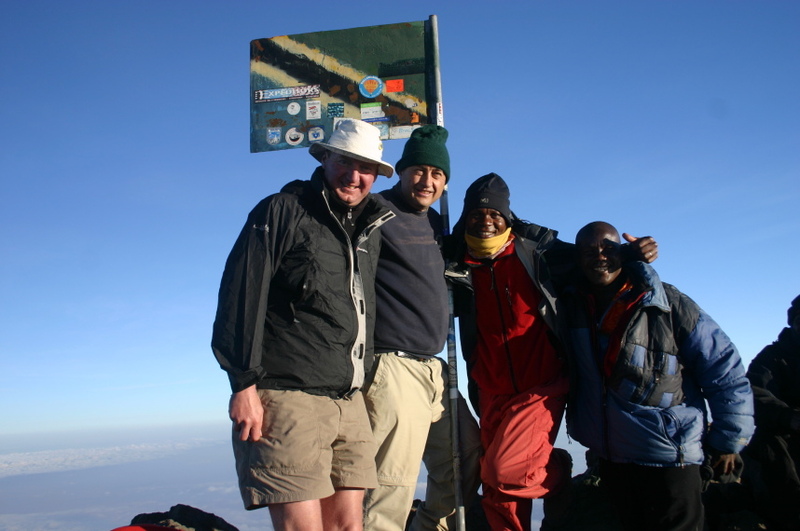 This is a very tough walk in high, remote mountains, on which you will have to be self-sufficient and where altitude can cause real problems. Come prepared. 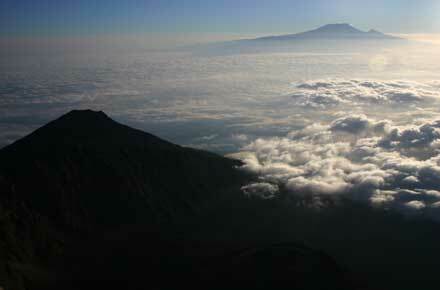 Mt Meru lies just off that vast cross-continental fissure, the Great Rift Valley, in an area of violent volcanic activity in northern Tanzania. 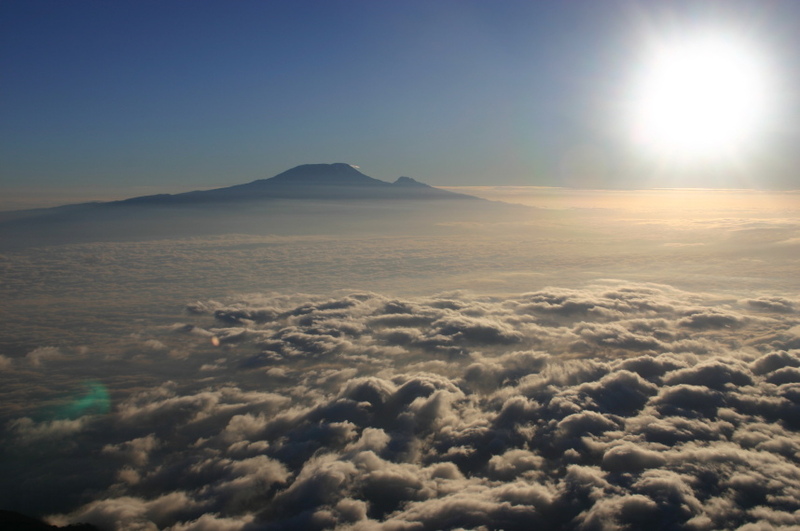 It was once larger than its celebrity neighbour, Kilimanjaro, but was shattered by a cataclysmic explosion 8,000 years ago, similar to the 1980 blow-out at Mt St Helens in north-western USA. 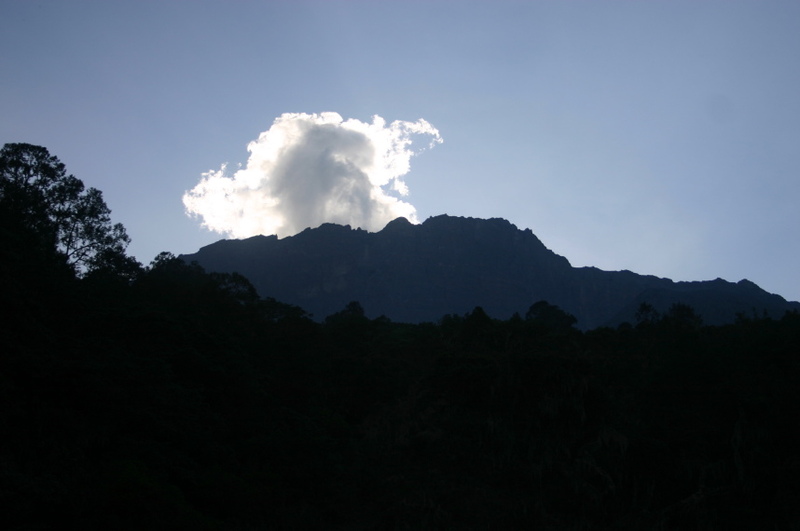 What is left is a vast horseshoe of dramatic cliffs around the abyss that was once the centre of the mountain, in which a youthful 1,000m high ash cone is growing. 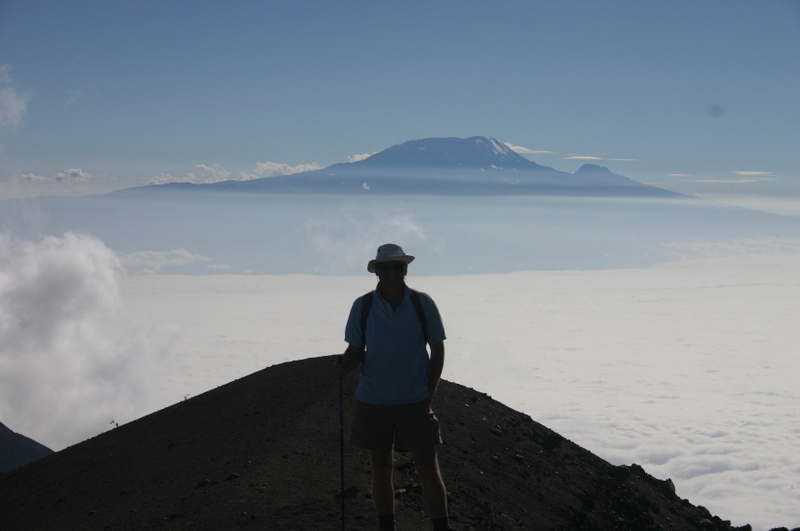 The views at dawn, straight across the vast crater and a blanket of low cloud to Kilimanjaro silhouetted against the bright early sky some 70km away, are unforgettable. 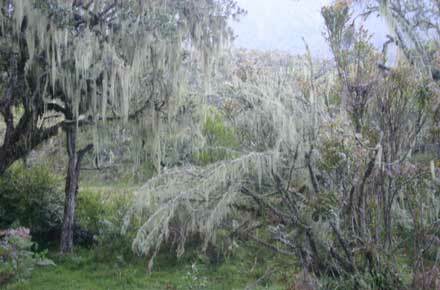 A special joy of climbing Meru is the change of vegetation, wildlife and scenery as you progress from scrub and grassland to beautiful montane forest, to tree heathers festooned with Spanish moss, to coarse grass and alpine shrubs, to naked and smashed rock. All in 48 demanding hours. 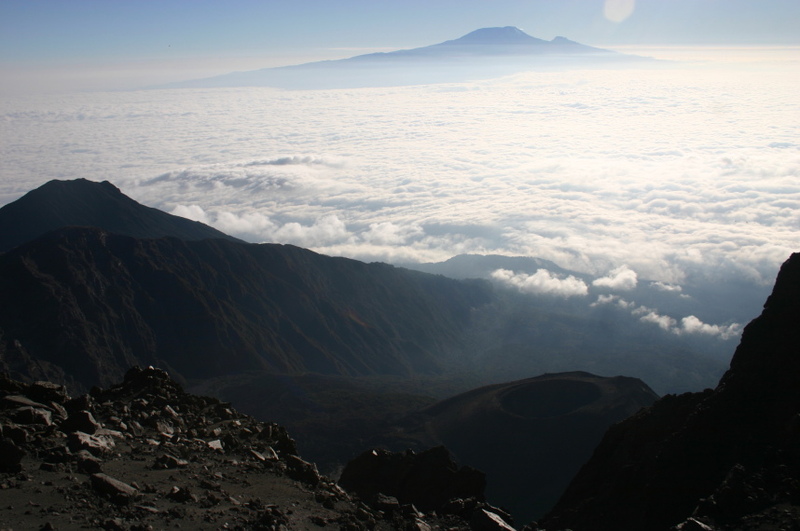 At 4,566m and the 5th highest mountain in Africa, this is a tough walk and you will feel sorry for yourself near the top. 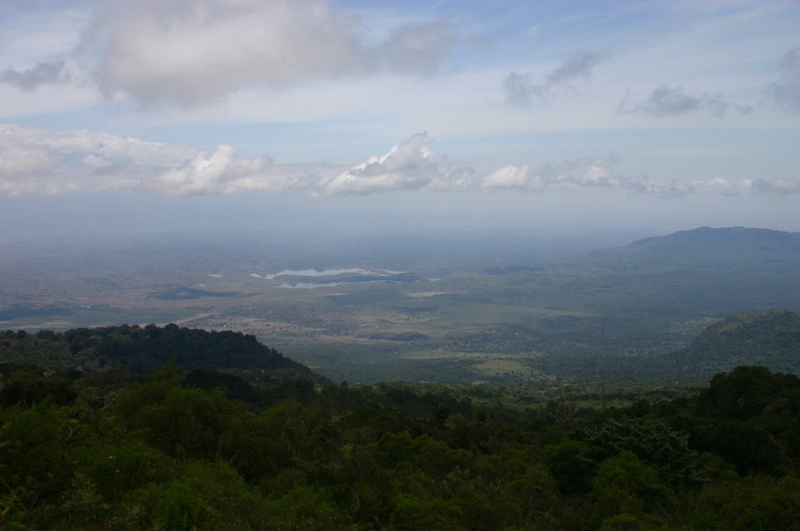 On the first day, as you climb to the Miriakamba Huts, you may encounter a fine array of wildlife giraffe, buffalo, bushbuck and colobus monkeys are all to be found as you pass from scrub to the magnificent forest. There are even elephants about. 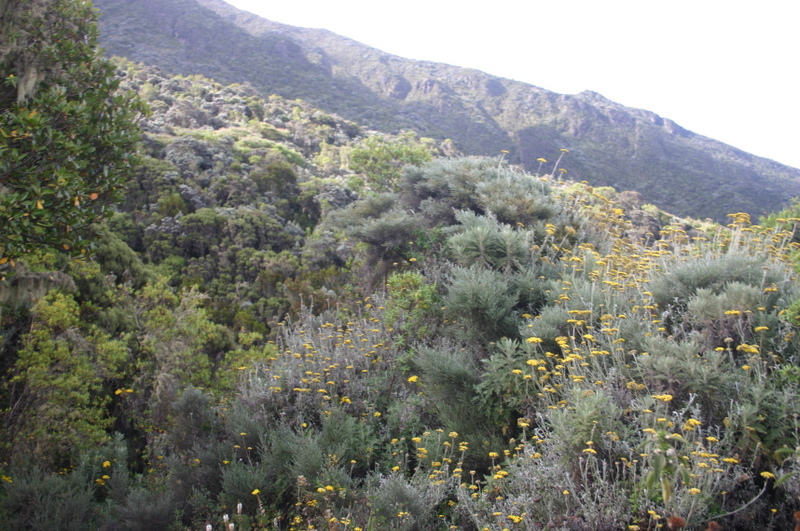 As you get properly inside the vast cauldron, you will walk through grey giant heathers, surrounded by the vast cliffs that form the crater rim. 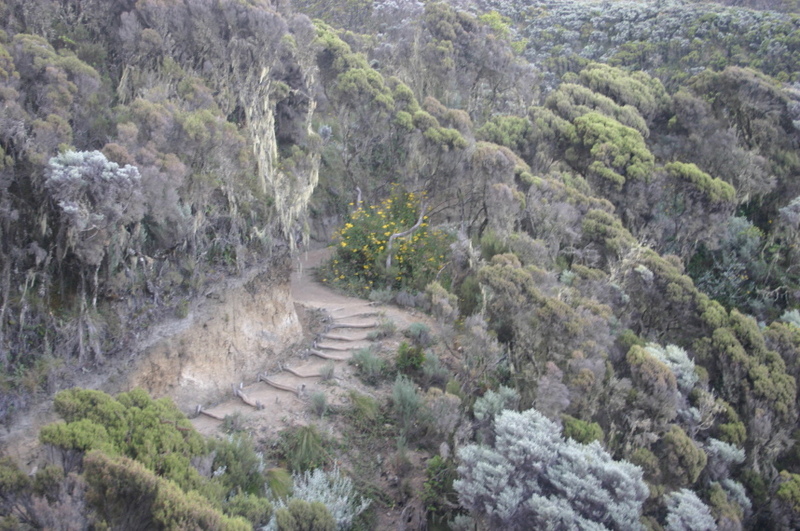 The main activity on the second day will be the tough upward path to the Saddle Hut, clambering up steep wooden steps early on. 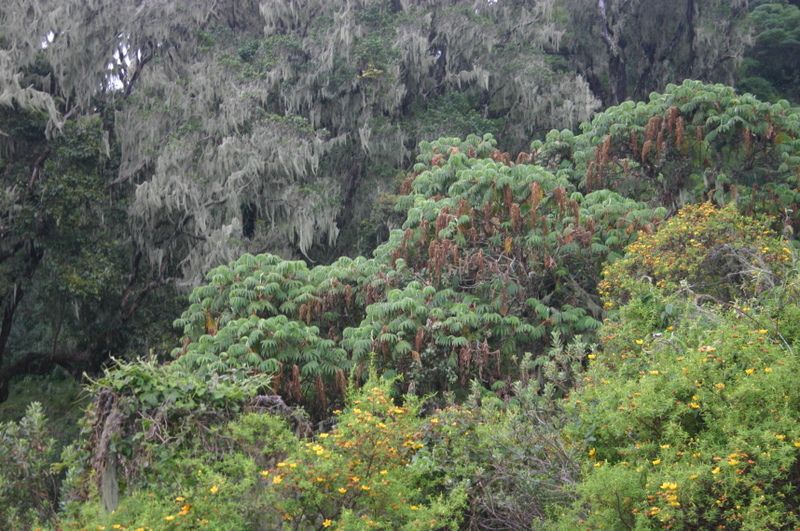 There are compensations: the forest on the outer flank of the crater wall is gorgeous: Hagenia drip with their clusters of red flowers, twisted Augaria support miniature jungles of their own ferns, mosses and other parasites. The birdsong is delightful. 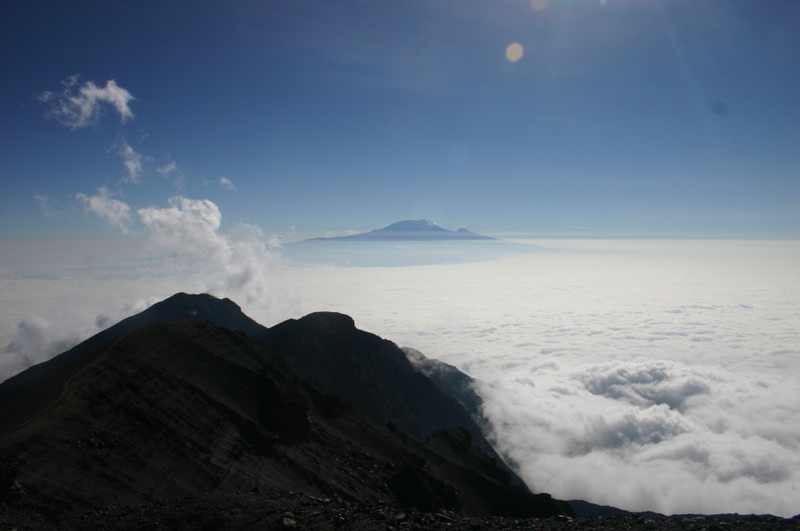 Reaching to the crater rim, you encounter another angle on the Meru abyss. Quite suddenly, you emerge from the trees and climb through thick clumps of giant heather, silver-leaved Phillippia and yellow St John's Wort. 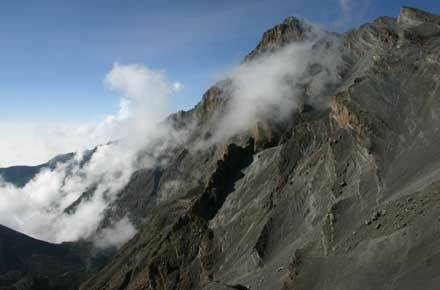 The views expand and you will see the fumerole peak of Little Meru above you. 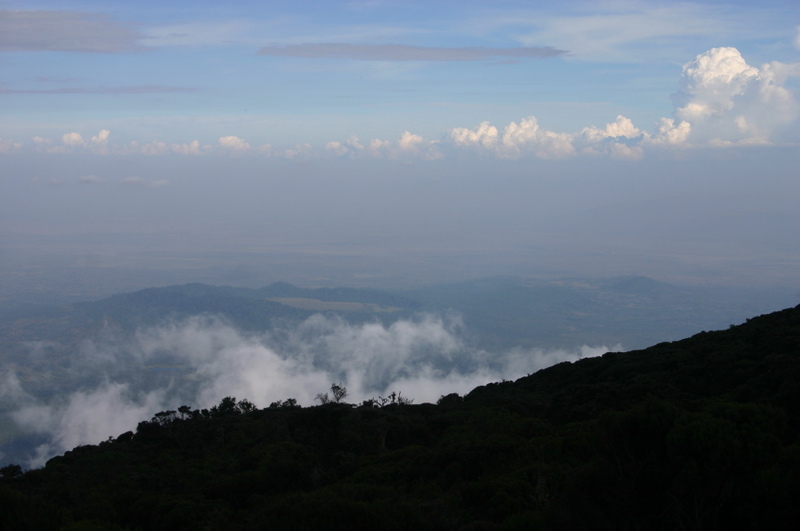 The other half of the day can be spent exploring the crater floor in the morning, or climbing Little Meru in the afternoon. 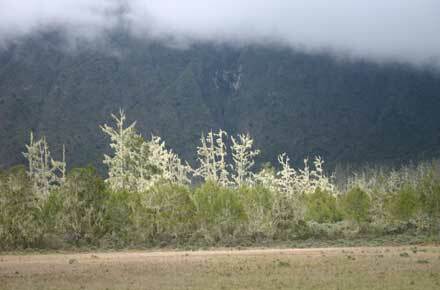 The four-hour slog to the peak on day three starts early, walking by the light of headtorches across the saddle between the two Merus, then up a steep hillside to Rhino Point on the crater rim. 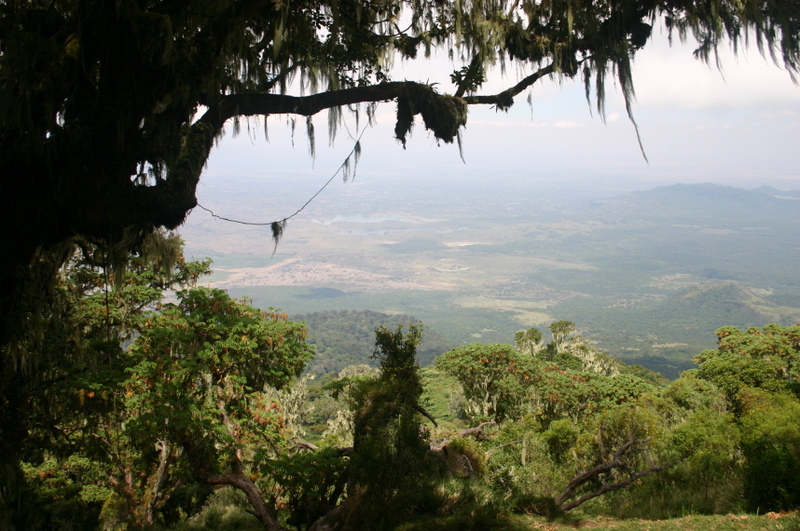 You then labour around the rim between the sheer cliffs of the crater on one side and the steep, broken mountainside on the other. The walk develops into a battle in places; tiring clambers over smashed boulders alternating with miserable slopes of cinders, half a step back for every one taken. The final scramble up jumbled rock to the Socialist Peak is tough. Descents are usually anticlimactic, but not this one. The different layers of the crater-edge rock tell enthralling tales of the aeons of ash deposit and lava flow before the final cataclysm. The hillsides to the west fall steeply, often in almost unbroken slopes of clinker thousands of feet high. 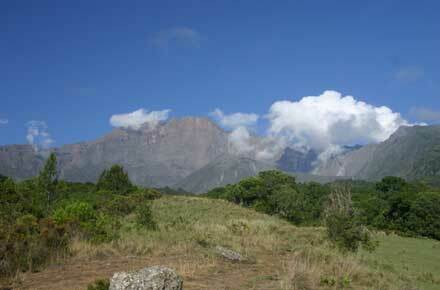 You will be very tired when you get back to the Saddle Hut, some 8 hours after you left it. 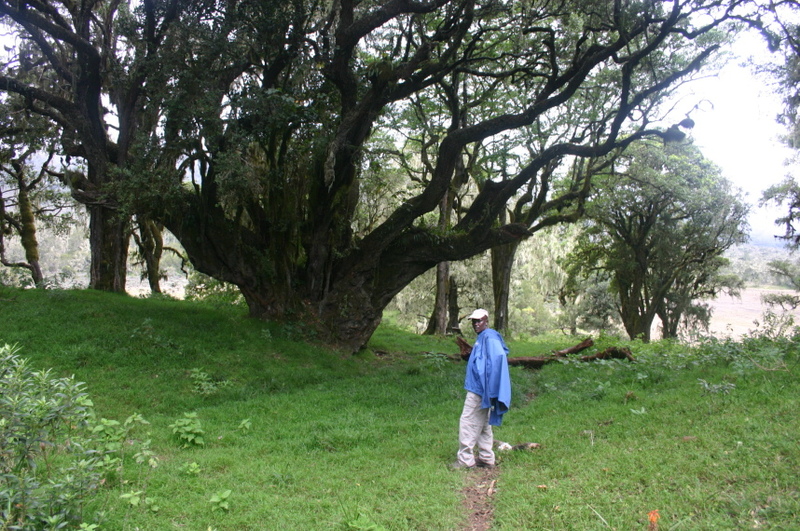 The final descent to the Momella Gate takes a couple of delightful hours and is best done early in the morning. 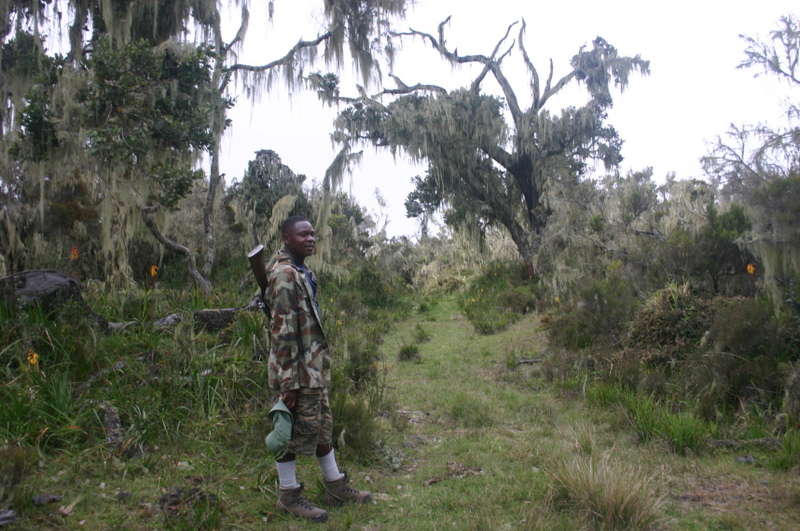 The trail winds down through beautiful forest, then follows long tongues of grassland between belts of forest on each side. Old lava flows, apparently. 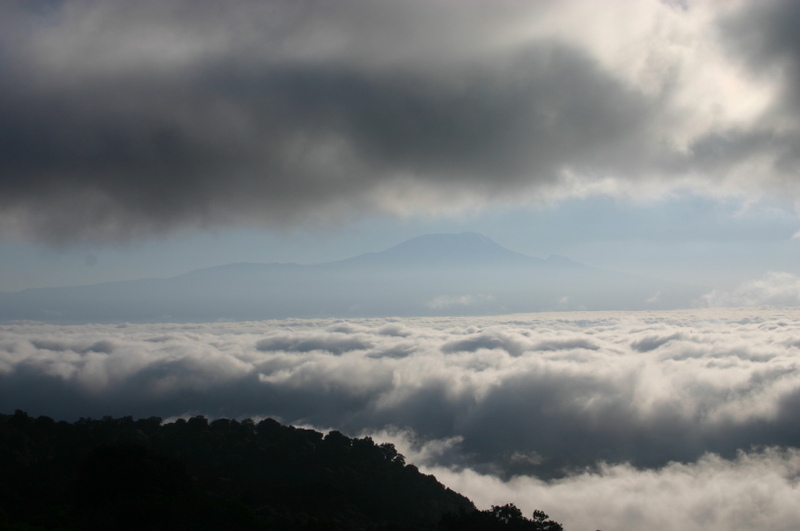 Ahead you may see Kilimanjaro appear through rents in the cloud, or Meru's crater rim high over the forest behind you. This is miserable, but it is almost over. 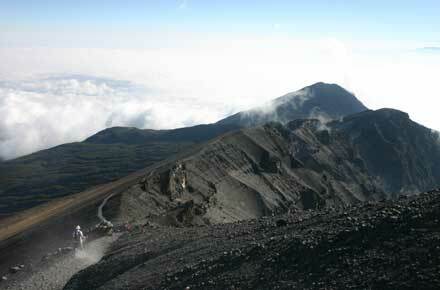 At 4,550m, we are pausing for breath every few steps as we scramble up the final mounds of broken boulders to Mt. 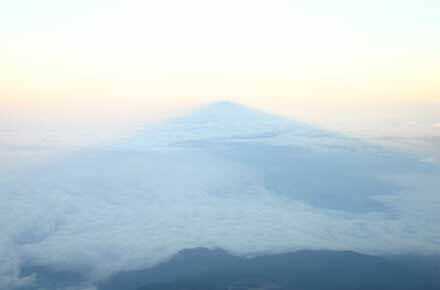 Meru’s peak. I am sweating and freezing at the same time. 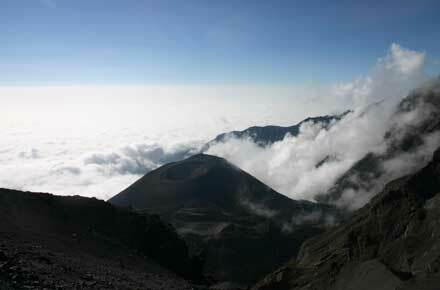 Then, as I step onto Meru’s Socialist Peak, suffering is in a scintilla replaced by wonder at the glory of existence. 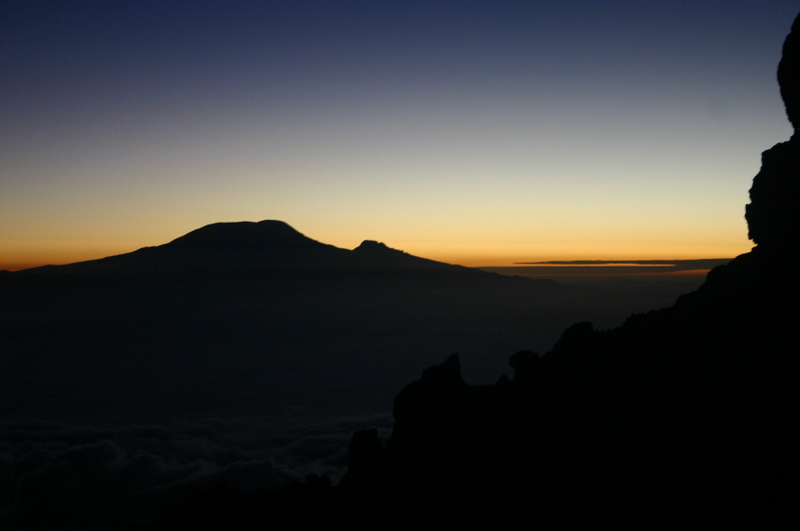 Straight across the vast crater, Kilimanjaro is silhouetted against the streaky pre-dawn sky, proud by two or three thousand metres of the rumpled cloud that blankets the east African plains. One of THE best ever. 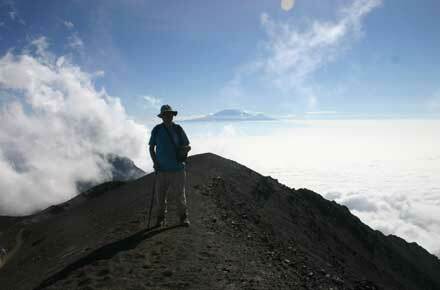 A better experience than Kili.